Interview with Lisa from The Little Reader [Armchair BEA] – my books. my life. I signed up for Armchair BEA ages ago. Then I forgot to check the site until last week. It was then that I realized I missed the Interview Swap signups and and assignments. Since this was my favorite part of BBAW, I really didn’t want to skip it. So, as always, I turned to twitter. And Lisa from the little reader came to my rescue. Which thrilled me even more because I love Lisa and I am so glad that I get to feature her on my blog today (you can find my interview on her blog). So enough from me for the day, meet Lisa. i started a personal blog years and years ago on LiveJournal and found myself writing the occasional book review (which my friends mostly ignored, the poor fools). i stumbled upon a few more serious book bloggers, thought it was a great idea, and decided to spare my friends from any further babble about books. with a little bit of help from my book bloggy friends, i started a separate blog just for bookish stuffs at the little reader in early 2010. although i had no idea what i was getting myself into, it’s been a lot of fun, and i wouldn’t have done a thing differently. definitely the beach. the light breeze and sunshine, combined with the sound of the waves is my absolute favorite. i’ve recently gotten in the habit of carrying a notepad with me everywhere, which means i’m always brainstorming about bloggy stuff. when it’s time to get to it, i mostly write from my desk at home, but i do love taking my laptop to a quiet little corner in a coffee shop with a book and a cup of hot tea. if you’d asked me this a year ago, i would have said literary fiction. but, something happened somewhere and i’ve become obsessed with non-fiction lately. i don’t know if i can say that my reading tastes have matured, but they’ve certainly evolved. well, that’s funny actually, since i’m just coming back from hiatus. i’m apparently not so good at the balancing thing because when life got too crazy with grad school, i had to take a break from blogging. as a grad student and triathlete, it’s sometimes difficult to find time to eat and sleep, let alone read or write. but, to help balance it out a bit, i have learned to incorporate audiobooks into the spaces where it will fit, like when commuting on the bus or training for longer runs. also, since i am in the English grad program (albeit not in literary studies or creative writing), i do occasionally find that i’m able to incorporate some of the same topics i’m studying into my blogging. really, my main goal is to keep it fun and interesting for me and my readers. otherwise, what’s the point? 6. Do you have a few favorite bloggers? Vasilly, at 1330V: one of the sweetest bloggers and best twitter buddies around! and for me personally, her reading tastes are just superb. she’s always introducing me to great books, readalongs, and other bloggers. Mark, from Absorbed in Words: he doesn’t write often, but it’s always worth the wait when he does. Dolce Bellezza: she writes beautiful and elegant reviews, has wonderfully eclectic tastes, and hosts the Japanese Literature Challenge each year. 7. What do think would be the best part of BEA if you could attend? the best part would most definitely be getting to meet the people that have had such a huge impact on me and my reading. with time zone differences and the geographic barrier of massive body of water, living in hawaii makes me feel so distant from the blogging community sometimes. it would be great to just put faces to the many wonderful bloggers that i’ve met and gotten to know over the last couple of years. 8. What kind of reader were you as a child? insatiable. i remember vividly those library reward programs where you read books to accumulate stickers to earn free personal pan pizzas at Pizza Hut. yeah, i ate a lot of pizza as a kid. 9. What is the best book you’ve read this year? 10. 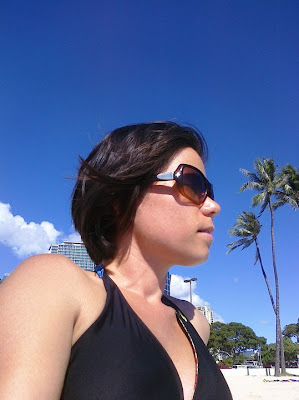 Should I move to Hawaii? yes! i’m from florida originally, so i can confidently say that moving from florida to hawaii is absolutely a great idea. oh, unless you like doing things that require money, because in comparison, jobs pay less and the cost of living is higher than most other places in the country. but, for people who can live a simple life (or for those that are independently wealthy, in which case i’m accepting sponsors), then yes, it’s an amazing place to live and play. Thank you, Lisa, for stopping by the blog today. Don’t forget to check out the little reader. Hmmm reading on the beach sounds absolutely divine. I’m off to check out her blog right now! Fabulous interview! I’m a huge fan of beach reading as well. Perfect! Also a huge fan of Vasilly, she’s wonderful and a perfect pick for a favorite book blogger. Great interview! Adding Fingersmith to my to be read list now! oh, the buttons! i had completely forgotten about those. ah, the memories.